One question, one simple answer, and your life has forever changed. You said “Yes” to the man of your dreams. Perhaps you are a little confused, somewhat overwhelmed. Fret not. Award-winning Designer, Rani St. Pucchi can help you get there. Next, you may want to plan an engagement party. An engagement party is a great way to gather together to celebrate, and is especially nice to have if your families don’t know each other well so they can get better acquainted. Think of the engagement party as a kickoff to all the wedding events that will happen on your way to the altar. It can be as simple as having a cocktail party at your or someone’s home or as extravagant as renting a club or your favorite restaurant. What you’ll wear depends on the formality of the event and the venue. If you are going formal, then an evening gown would be appropriate and help you stand out. Shorter dresses with interesting details, perhaps with lace trimmings, are a good choice for a casual outdoor affair. Rani St. Pucchi is an award-winning Couture Fashion Designer, a Style & Image Consultant, and a Relationship Expert. She is a Bestselling Author, a Speaker, an Inspirational Coach and a Trainer. Her recent TEDx talk: Is Your Body Image Holding You Back has received worldwide acclaim. Rani’s #1 International Bestselling Books: Your Body, Your Style: Simple Tips on Dressing to Flatter Your Body Type; The SoulMate Checklist: Keys to Finding Your Perfect Partner; and Your Bridal Style: Everything You Need to Know to Design the Wedding of Your Dreams are available on Amazon and at Barnes & Nobles. With the holidays quickly approaching, what better way to kick off the New Year than with a new marriage? A New Year's Eve wedding is the perfect time to celebrate your love. Why save the Champagne toast solely for the reception? Have a toast ready for partygoers when the ball drops, and with a dress that is sure to be the center of any extravagant party. New Year's Eve is the perfect time to try something out of the ordinary, like a blush dress for the ceremony. Then, for the reception, slip into something short and sassy to dance the night away! The occasion calls for something fun and different. There's no better occasion for something truly glamorous like a New Year's Eve wedding. We love the drama of this St. Pucchi couture gown. Don’t you? And if you’ve just got your ring and said “I Do” and “I Will”, then our designer Rani St. Pucchi is here to hold your hand thru the entire process of planning your wedding in her upcoming book, Your Bridal Style: Everything You Need to Know to Design the Wedding of Your Dreams. You will be pleasantly thrilled with the advice offered in this 350 page, full color book - a treasure trove for every bride planning to design the wedding of her dreams. It was the end of the third day of the Bridal Fashion Week and I was exhausted. It had been a long day. I had not had a moment’s reprieve as I served one buyer after another. I looked at the pile of paperwork laying on the little wooden desk in the corner of my showroom. I picked them up now and glanced thru them in disbelief, thanking God for the turn of events that day. As a novice in the fashion industry I had never thought of asking clients for a deposit to help with my production. I started to panic now, and picking up the phone I started to make several calls, reaching for help from near and dear ones, but none was forthcoming. But the Universe was looking out for me, and sent me an Angel. She was the owner of the most prestigious bridal salon in Brooklyn, New York at the time. I remember her like it was yesterday. The beautiful, gray-haired woman had taken a chance on me, and I recalled how she sat at the table in my showroom, going thru the bowl of Hershey’s kisses with gusto, making mental notes but not saying much while she proceeded to write a generous order. On the last day of the show she came back and invited me to dine with her. I was surprised and humbled. At dinner Ms. Hedda Kleinfeld took me by the hand and said: “Child, you need help I can see. You have a great eye for design and craftsmanship and a wonderful future ahead of you. I want to help St. Pucchi succeed. Here, take this…” As she handed me a check for her entire order, tears filled my eyes. How could she have known?? Not only that, but within a week I received a package from her with a note “Learn from this piece how to make beautiful trains for your beautiful bridal gowns”. The package contained an old sample wedding dress. Again I thought how did she know? Wedding dresses worn by those in Asia at the time were all floor-length, and I soon learnt that the American bride wanted three feet long trains! I was clueless on how to make patterns that would flow well. If I was convinced before that I had a gift to share with the world, I was even more committed now to not letting Ms. Hedda down. I vowed there and then that I would be hailed as the best designer in America one day. I took immediate action and flew back to Bangkok, bought two sewing machines and set up my first “factory” in my little home. And I reached out diligently to buyers and media alike. I called every store across the U.S, and all the national and international bridal publications. Yes, the Universe had my back and nothing could stop me. Within a year of seeing the amazing results of my hard work, I made a firm decision and set a goal to be recognized as the best bridal designer within 5 years. I wrote my goal down in my journal. I visualized going up on the stage in front of thousands of people, press and buyers alike, and receiving my award. I wrote down affirmations around my visualization and played that image again and again in my mind. It was a tape loop that I never let go. Within 18 months of setting my goal and visualizing, I was nominated as the Best Bridal Designer in Dallas. At the same time I designed eveningwear and special occasion dresses. Buyers and press welcomed the novelty and the unique concepts in my designs. I continued to receive nominations in this and many other categories, finally receiving the highest honor in the U.S.
My first DEBI (Distinctive Excellence in the Bridal Industry) award as the Best Bridal Designer in October of 1990, was received just a few months shy of my 5 year goal. Since then my designs have been recognized globally and I have since received numerous awards. Today St. Pucchi dresses have been shown on every major catwalk across the world, featured in every major magazine and media, been on numerous TV shows, most notably on the hit TV sitcom Friends. I have personally worked with more than 15,000 brides and women of distinction, dressed numerous celebrities, artists, singer-songwriters and sports personalities. All this would have never been realized had I not followed my dream, visualized and taken massive action! So visualizing, and then taking action, are key to your success. Because I embraced my vision and took action, I turned one dress into a bridal empire. You see: Success is a journey, not a destination. Now I want to ask you this: What is YOUR dream? If you have one that you would have realized, then I implore you to own your dream and move heaven and earth to make that dream come true for you. As you stand looking back over the last few years, you find yourself completely AWESTRUCK. You’re able to make the “right” decisions quickly and easily, and you’re able to accomplish way more in less time, and with greater ease. And you’re enjoying more financial abundance, success and fulfillment than ever before! Would you love to be standing in this place, just five years from today? Visualize as if your dreams have already been realized. And then, take massive ACTION! Hold onto your dream with fierce determination. Rani St. Pucchi is an award-winning Couture Fashion Designer, Style & Image Consultant, and a Relationship Expert. She is a Bestselling Author, a Speaker, an Inspirational Success Coach and Trainer. Her #1 International Bestselling Books, Your Body, Your Style: Simple Tips on Dressing to Flatter Your Body Type and The SoulMate Checklist : Keys to Finding Your Perfect Partner are now available on Amazon and at Barnes & Nobles. If you’re anything like me, you have BIG DREAMS for your business and for your life. The problem is, dreams alone lead nowhere and will never make your business wildly successful. Your visions, ideas and dreams must be paired with the most important secret for success… how you show up in the world - and the actions you take. I had a dream. I was consumed by it day and night and I visualized it as having already been achieved. Did I ever doubt myself? Yes. Absolutely. On more occasions than I care to recall. Who was I to think, let alone believe, that I could make my mark in the American Bridal Industry? I had so much going against me: I had absolutely no academic design background - I was an English major; I had no money except for the one green American Express card that I had already maxed out; No one in my family supported my dream - in fact they only laughed at my lofty aspirations. And I did not know anyone in this foreign land. As I write this I am reminded of so many obstacles I was confronted with… never more so than during my recent visit to Bangkok. To my surprise I ran into one of the people I’d known for years but had not seen ever since I had moved to Dallas. It’s always exciting to catch up and trade stories on how much we’ve all grown and where life has taken us. In fact I recalled that she was among those, who, 32 years ago, scoffed at my dreams, letting me know that my goals were totally unrealistic. She told me I was surely setting myself up for a disappointment, that I should lower my expectations, and that I should live within my means. Even though I felt deflated initially by her comments putting it down to some jealousy perhaps, to be fair her feedback was sound and I believe now that she delivered her perspective with some compassion, and genuine concern. I recall so clearly stepping back and reexamining my dream and lofty goals then, realizing that YES they were indeed pretty outrageous, but that was exactly the kind of outrageous that would fire me up and motivate me to work harder just so I could prove everyone wrong. If you're like me and you tend to dream big dreams, there’s a good chance you’ll face voices of dissent. And most of these will be from well-meaning family, friends, even strangers. Tragically though, the most damaging voice of dissent often comes from within us. It’s our self-talk that we don't have what it takes to succeed, that we just don't have the right ‘stuff’ to be victorious. It’s this self-doubt that stops us in our tracks. Now I would like to take you back to that stress filled day in April of 1985. To the time I felt I had really messed up. I kept looking at the showrooms around me and the buying frenzy that was going on. Every showroom was filled to the brim with people writing orders and shaking hands and laughing. And here I was, across the hall from them, with no action except for the press taking notes frantically and photographers snapping pictures with their cameras. I would look wistfully at my beautiful babies - my creations, the luxurious colorful wedding dresses all waiting to be touched and admired. In my heart I knew this was the most beautiful collection I had ever designed in my life. And I knew it was only a matter of time before buyers would take notice. Because lo and behold, the next morning as I walked into the glass building making my way to my showroom, a stack of The Dallas Apparel News piled up on the front desk at the foot of the elevators stopped me in my tracks. My heart skipped a beat as I looked at my face staring back at me from the front page of the Bridal industry’s most revered paper. The media wrote about my courage and daring in upsetting the industry norm. And hailed me as the pioneer for introducing color and silk fabrics to the U.S. Bridal scene. I could not believe my eyes and was so encouraged and humbled by the recognition. I wanted to shout from the rooftops! But kept my composure and headed to my showroom. There was a line of buyers waiting for me to open the doors. If you're not happy with the success in your business, then you owe it to yourself to do something about it. If you're ready to finally do something about your level of success (except complaining about it or just wishing it gets better on its own), then take action, however small it may be. Every day do a little something that will move you toward your goal. Know that there's a big difference between dreaming and doing. And while no one can deny the power of positive thinking, far too many people neglect to act on those thoughts to make their dreams a reality. Rani St. Pucchi is an award-winning Couture Fashion Designer, Style & Image Consultant, and a Relationship Expert. She is a Bestselling Author, a Speaker, an Inspirational Success Coach and a Trainer. Her #1 International Bestselling Books, Your Body, Your Style: Simple Tips on Dressing to Flatter Your Body Type http://amzn.to/2eRcOb6 and The SoulMate Checklist : Keys to Finding Your Perfect Partner http://amzn.to/2gXiHFz are now available on Amazon and at Barnes & Nobles. There seems to be a lack of content out there that describes this pivotal time when we have more ‘I don’t knows’ to offer than certainties. I realize that life has a way of figuring itself out, and no matter how hard I try to make sense of what happens, I can’t recall a single time when worry or fear aided the progression of my life. As someone who had spent years dreaming about one day living in Dallas, I was totally convinced that the opportunity given me was short of nothing less than a Divine intervention. I had a unique fire in my heart and a calling on my life that I trusted would play out. I had more questions than answers right then. When I had the dream of one day living in Dallas, I had no clue as to what career I would follow, nor how I would be lead there. All I knew was that perhaps if I stopped mulling and stressing over the ‘how’ and just followed that small tug on my heart, then it would lead me right where I needed to be. And so here I was. Saying ‘yes’ to my dream. I had been fortunate enough to manifest the first step. Now came the hard part. It was time to be real. Time to set a clear goal of what exactly this life in Dallas was going to be about. How was I going to not only make a living but also be a success at my craft? Having accepted the offer to show my Bridal Collection at the Dallas Apparel Mart, I prayed that the Universe would back me up. There was no time to waste. I had only six months to put together my collection. My goal was very clear: to be a success and to make my mark in an industry that I was pretty clueless about, in the city of my dreams, and in a country that I knew without a doubt I would be adopting as my “home” one day. I wrote down a detailed list of everything I would need: the funds required, the types of fabrics and laces, jewels and notions, and the biggest challenge of all at the time: to come up with creative and unique ideas for my first bridal collection. I set myself small steps on my way to completing the bigger goal so that I would not feel so overwhelmed. I designed it first in my mind. I saw the embroidery details. I started sketching feverishly and ideas started pouring out. I worked with fabrics and notions, colors and patterns. Designing bridal gowns was a spiritual experience for me. Although the designs flowed through me, I knew it was really the Divine doing the work. I was as if in a trance. I visualized the success of my first bridal show, and in my mind’s eye I saw the press and buyers loving each creation. I saw orders pouring in. The collection now ready, I flew from Bangkok to Dallas, Texas. On April 15th, 1985, the day before my first Bridal Show, I registered my company ‘St. Pucchi’ on a wing and a prayer. I decorated my showroom at the Dallas Apparel Mart with much anticipation and excitement. I had no clue as to what other designers would be showing since every showroom window was shrouded with opaque sheets of paper so that no one could peer in. This was the very first show for me and I designed and decorated the showroom the best way I knew how, mostly based on what I had seen on the TV screen, especially on the series ‘Dallas’. Sixteen mannequins on raised platforms of differing heights, clad in my handiwork, decorated the 600 square foot showroom, with one form behind each glass window on either side of the entrance. This was the collection I was called to design, the one that I prayed would launch me as a “Bridal Designer” in America. The day the show opened, I looked at the displays in all the other showrooms around me and my heart skipped a beat. OMG!! What had I done? All around me was a sea of white. White in every window, in every showroom, on every floor of the building. And my sixteen piece St. Pucchi bridal collection was entirely in color. I had not designed a single white dress. I felt I had really messed up! I had not taken the time to study the US bridal market and had not known what was the accepted norm in the American Bridal world. Growing up in Thailand I saw only colored wedding dresses, mainly blush colored ones. Weddings were a celebration- in color. White was mostly worn during mourning. Buyers would walk past my showroom, stop and gasp. The press would swarm around and flashes would go off as they eagerly photographed away. People were flabbergasted by such a controversial concept and I could hear their thoughts loud and clear: Who was this designer? How could she even think that America would embrace color in bridal wear?? You see… it didn’t matter what others said. What mattered was that I believed in what I was doing. I felt passionate about my work and felt so deeply in my heart that I had finally found my calling. This audience didn’t really understand me yet. Designing was my passion, and fashion my calling. I knew that now. I felt as if I was the witness hovering above and watching as things unfolded. Is your goal aligned with your dream and your passion? If you’re not clear on what that is yet, may I suggest that you live in a constant state of curiosity, and be open to possibilities? You’ll be pleasantly surprised that this curiosity may well lead you to find your passion one day. And when you do, don’t let anyone talk you out of it. Hold on to your dream. Set a goal. Visualize. Tulle ballgowns are a fairy tale dream; if you’re looking for the quintessential princess wedding gown, then look no further than a beautiful tulle wedding dress. And these St. Pucchi ballgowns are absolutely stunning. From striking floral details to delicate hand-embroidered motifs, these tulle ballgowns are simply breathtaking. From the Avine Perucci collection, this St. Pucchi tulle wedding gown features silk hand-embroidered floral appliqués scattered on the skirt and bodice. The strapless top is a classic choice and the waist features a duchess silk satin sash. This gown is currently part of the on-going St. Pucchi sample sale. For the bride looking for a wedding dress that isn’t quite white, this St. Pucchi Sposa wedding gown is a gorgeous option. The color is a lovely ivory tone and the tulle ballgown skirt features flirty layers. Flower clusters also adorn the skirt and the strapless corset bodice. This gown is part of the St. Pucchi Sposa sample sale. A full tulle skirt can still have movement, which is exactly what you’ll get plenty of in this St. Pucchi Sposa gown. The extra full skirt features beautiful satin flowers on one side that picks up part of the skirt and alençon lace appliqués adorn the back waistline. This tulle ballgown is also another ivory pick and has a satin bodice with boning that beautifully shapes the torso. For a traditional tulle wedding gown, this Mila St. Pucchi gown is a gorgeous pick. It’s part of the ongoing sample sale and features a heavily-crusted strapless bodice that has a shimmery effect. The sweetheart neckline is flattering for many body types and the multilayered skirt features a sweep train. This St. Pucchi couture wedding gown features delicate details like gorgeous flowers that adorn the full tulle skirt and the sweetheart bodice. Complete the look with this handmade mantilla featuring stunning hand-embroidered flowers. Another St. Pucchi couture wedding gown with a tulle skirt is this gorgeous pick featuring a drop waist. Sheer lace detailing adorns the bodice, which flares out into a dramatic full skirt. (For even more sheer wedding dresses, check out this post). What do you think? Would you wear a full skirt wedding gown featuring a tulle skirt? What drew me to this particular St. Pucchi dress is how intricate and delicate the details on the dress are. The satin fabric and design of the dress speak class and elegance. The delicate hand-sewn flowers are the perfect touch of femininity and romance. It's truly a timeless design with the perfect touch of drama. St. Pucchi dresses embody this, and I believe this is what makes the brand spectacular. My husband John and I got married at the Ritz Carlton of Naples Florida. It was a gorgeous day! My dress was the first item I purchased for the wedding, before planning anything--choosing a venue, colors, etc. What I didn't know at the time was that it was the dress that would bring inspiration for planning and speaking to the look and feel of the celebration. Romance, class, elegance and femininity were all words I wanted to reflect my wedding celebration, all words that described my St. Pucchi gown. 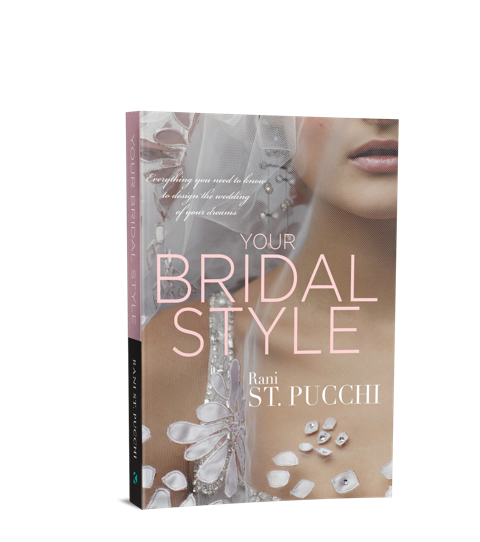 This month, the bridal designer behind St. Pucchi, Rani Totman (a.k.a Rani St. Pucchi), published a brand new book unveiling her style secrets learned from years in the fashion business. "Your Body Your Style: Simple Tips on Dressing to Flatter Your Body Type is available now on Amazon. In this exclusive blog post, we're sharing with you one of the topics covered in Rani's book, the best clothes for your body type. Because from your rehearsal dinner and engagement party to the honeymoon and beyond, there are plenty of occasions when you'll want to look, feel and dress your best! Here, a few guidelines on the best clothes for your body type. Do: Focus on your waist and flatter those curves! Waist-cinching belts, V-neck dresses and and tops are your friend. Do: Accentuate your bust and hips in long sleeve and V-neck tops. Dark colors help camouflage heavy areas. For your pants, make sure they sit below the hip bone. Do: Off-theshoulder blouses and other tops that accentuate your upper body. Straight leg pants with heels are also fun and fashion-forward. Avoid: Flare-legged pants or other styles that may narrow your legs. Do: Create curves by cinching your waist and trying flared skirts. Ruffled tops will help add volume to your chest. Show off your legs in skinny jeans, miniskirts and bright tights. Avoid: Boyish clothes like track pants & baggy boyfriend jeans. They’ll do nothing to flatter your figure. Do: Wear flares on bottom with snug tops to draw attention to your hip area. Avoid: Items that will make you look top-heavy like ruffled and embellished tops. Many women are a mix of body types, so mix and match different styles until you find what’s right for you. You can purchase Rani Totman's book, Your Body, Your Style, here. It's summertime and the perfect time for celebrations. Looking for ways to add a splash of the season into your wedding day? We rounded up a few of our favorite summer wedding ideas, from fun dessert activities to keeping guests cool during the summer heat. Kick off your summer wedding with a midi length floral affair. This wedding dress is perfect for looking stylish while beating the summer heat. Treat your guests to a s'mores treat by the fire for your ceremony. Get inspired by the countryside. Pick a dress with lace and floral appliqués, and wed with a backdrop that compliments the dress. Wildflowers used as a bouquets and table decorations make for a summer country-chic affair. Summer calls for a cool glass of rosé, embrace the theme with rose-tinted nuptials. A rose-colored wedding dress and beautiful rose decor are romantic and perfect for a summer wedding. Are you having a summer wedding? Which idea will you incorporate?